What does the word “propitiation” mean when used within the context of Scripture? What does it teach us about God and specifically, about Christ? The actual word “propitiation” isn’t used very much in the Bible but the concept of propitiation is found from Genesis 1 to Revelation 22. Paul wrote that we “are justified by his grace as a gift, through the redemption that is in Christ Jesus, whom God put forward as a propitiation by his blood, to be received by faith. This was to show God’s righteousness, because in his divine forbearance he had passed over former sins” (Rom 3:24-25). So propitiation is not a human act of kindness or benevolence. It is 100% fully a work of God (Eph 2:8-9). It has nothing to do with what we do or have ever done. It shows the righteousness of God, not the righteousness of man, which to God is like filthy rags (Isaiah 64:6) and God will not accept our works. He only will accept the redemption bought and wrought but Jesus Christ because Jesus is sinless and it was by His righteousness that we were saved from the wrath of God. We are anything but sinless. Instead of asking what propitiation is, I think it might be better asked, Who is our propitiation and that is found in Scripture. The Apostle John wrote that “In this the love of God was made manifest among us, that God sent his only Son into the world, so that we might live through him. In this is love, not that we have loved God but that he loved us and sent his Son to be the propitiation for our sins” (1 John 4:9-10). As Paul said “It was to show his righteousness at the present time, so that he might be just and the justifier of the one who has faith in Jesus” (Rom 3:26). Jesus Christ “is the propitiation for our sins, and not for ours only but also for the sins of the whole world” as John tells us. The author of Hebrews tells us exactly the same thing when he wrote that Jesus “had to be made like his brothers in every respect, so that he might become a merciful and faithful high priest in the service of God, to make propitiation for the sins of the people” (Heb 2:17). 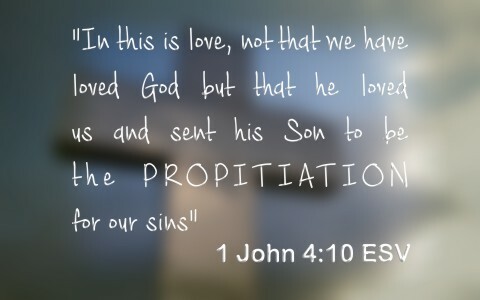 The best definition I can give you about what propitiation is that it is the wrath of God being placed on Jesus Who didn’t deserve it and not on us who did. It is the satisfaction of God’s wrath abated by Jesus beating, suffering, and death on the cross. God’s wrath that was due on all who disbelieve in Jesus (John 3:36b) was satisfied in the cross by Jesus. Jesus died for those who deserved eternal fire and took to Himself the wrath or was the propitiation of the Father for the righteous punishment of sin and God was perfectly satisfied with that by the perfect Lamb of God. That’s why the gospel is the good news. The good thing is that we were spared the deserved wrath by this wrath being placed on Jesus. None of us are good, not even one of us (Rom 3:10-12), but we being very bad have been forgiven by a very good God Who made Jesus the propitiation for our sins. Something else that might interest you: What Does Atonement Mean? Resources – Scripture quotations are from The Holy Bible, English Standard Version® (ESV®), copyright © 2001 by Crossway, a publishing ministry of Good News Publishers. Used by permission. All rights reserved. Packer, J.I. Knowing God, Downers Grove, IL: Intervarsity Press, 1993. 207. Previous post: Can The Bible Become An Idol? Next post: Who Are The Nicolaitans Mentioned In The Book Of Revelation?